Before I stepped foot into the forest, I had no map; I had no guide; I had only a diary by BobJ who described Grev thusly. I expected something good, and I received something majestic. Read on, O ye stout of heart and sinew — five tales from the indie perfumery Slumberhouse await! A black satchel with all the samples I requested, plus a few extras. No notes; just imposing black velvet and the labeled spritzers. Beauty in silence; a forboding beauty like an abandoned monolith. This is the smell of sour cranberry or rhubarb, maybe both, over light woods, mingled with incense and something ethereally airy. Vaguely burnt-candle-ish, it’s like you just stepped into an obscure candle shop, and it’s so sour that your glands almost squirt in anticipation. Initially the silage is three feet or so. You can smell it on yourself, but it refrains from invading enclosed places like elevators. At different stages, different parts of the composition come to the fore: sometimes incense, sometimes woods, and towards the end, the woods and rhubarb/cranberry in unison. I suspect a sour cherry note lurks here as well. Rume survives light workouts and lasts 14 hours. It is a semi-linear, thoroughly captivating scent. 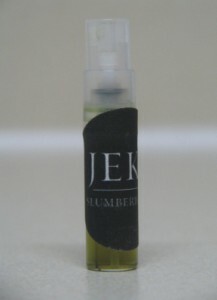 Jeke wreathes you with the aroma of smoky woods: deep woods; deep smoke; very realistic. You are outside on a winter day and a fire is burning far off. The effect here is like a call to adventure — manly and aggressive. It speaks of autumn and without even a rustle of leaves, it utterly entrances me. Silage is at least five feet, enough to prompt complaints from undeveloped noses, who mistake this scent for spilled cleaning solution of all things! Later on, some slight musk appears. By 12 hours it frays into faint pine plus sandalwood. In the first 5-10 minutes, Norne transports you deep within a pine forest, and the aroma of branches, bark, and pine needles surrounds you. Words of olfactory devotion spilled from my lips. A faint smoke accord weaves its way through the scent, and a bit of acridity too, like you spent the day piling up pine firewood. Something menthol, I smelled for a fleeting moment. With two sprays (note: application warning) the silage is at least five feet. It does not conquer floors, but others will know of your presence. Norne is powerful and masculine; others notice with an appreciative slightly-raised eyebrow. Duration is at least nine chimes of the clock. 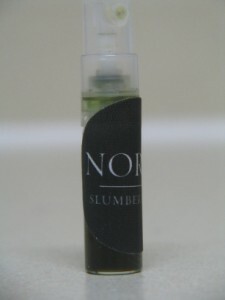 By this time, I had realized the power of Slumberhouse fragrances. I applied this in a more respectful manner — one spray to the chest. Grev is definitely fir — fir needles and fir branches. It also has an airy, fresh, and brisk top note to it. Now according to some, this scent is far too aggressive, but the clean top note should keep women from turning up their noses. Throughout its 10+ hour skin life, Grev tacked back and forth from woodsy to airy, and by then I had concluded that those were simply different aspects of fir. In the end, the scent attenuates and shifts slightly to remind me of Brut. On clothes, the scent lasts at least a day. This scent opens with a clear note, warmed cinnamon, and something massive beneath them for support (leather, most likely). Minutes passing reveal something rooty, outdoorsy, and aromatic. You feel like you stepped into a cinnamon bakery shop, with the yeasty smell of bread present as well. 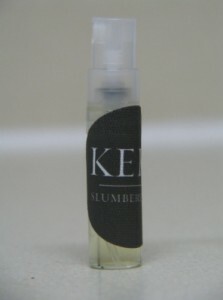 Half a spray radiates 4-5 hours, and endures as a skin scent 8-9 hours. Towards the end, the clear note and the warmth of the spices combine to create a caramel note, which I savored. Only my dislike of gourmands keeps me standoffish; for a genre that I dislike, Kere is the highest-quality gourmand I have smelled yet. 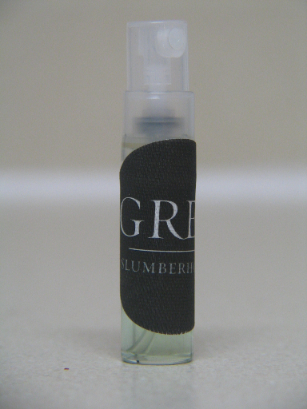 Slumberhouse has mastered the scents of deep forests and of obscure, mystic locales. These five scents are semi-linear, meaning that they smell like some part of how they began. This, I found quite pleasing, for you could predict your future olfactory state, and yet, variety was not absent. It was as if the entire cast presented itself before the play, and the spotlight rotated from one member to another, and some of them in ensemble as the play progressed. Although Slumberhouse does create femme-friendly and less aggressive scents, I raise my staff to them for these creations. Much of the fragrance industry is emasculated, and busies itself creating “less offensive than thou” scents, which dispirit me more than attempts to endure mainstream movies. Yet in the forested world, on the edge of civilization, dwells Slumberhouse. At least four of these scents speak of ancient and eldritch masculinity, of noble woodsmen, and of lonely travelers wandering through distant wooded realms. These scents are wholly divorced from the oversexed world of perfume; they are a kick to its ribs instead. I delight in these scents. The noble and the brave will as well. I feel like a waif out of Dickens drooling outside someone’s dining room window. You’ve made them sound splendid in a way that makes it clear that they won’t work for me, but thanks all the same for an entertaining and well-written read! P.S. How funny that you should love these after the horrible Frankenpearolive. My, these sound lovely. Personally, I like the idea that a guy would smell foresty and manly much of the week and then take a break once in a while to smell like cinnamon bread! Must try these, especially Rune – I’m always looking for a good cranberry or rhubarb that’s not doused in vanilla sugar. Thanks for this, Silverfire! No you’re right; it’s Rume. Thanks for catching that. I do have samples, but I want to keep them for myself (and they’ve been used more than a few times, too). Anyhow, thanks for checking out my review! Alas, none. I am looking forward to getting some, though, when I have the money. 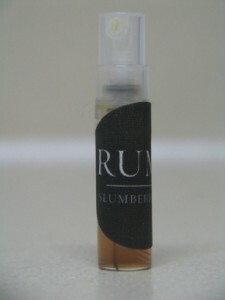 It’s sad that they discontinued Rume, though. That was one I really wanted. Oh well. Take it easy! Leave a reply on "Slumberhouse: Tales from Majestic Forests"